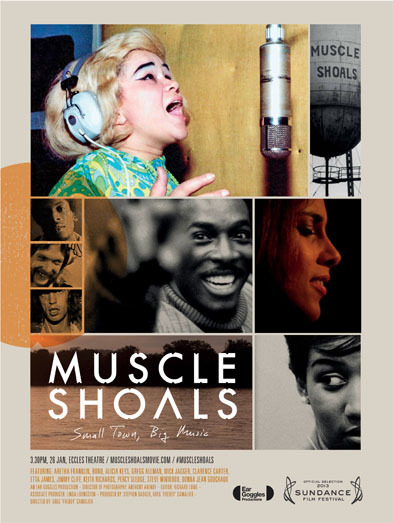 You may not have heard of Muscle Shoals, but you've surely heard of the music recorded there. Percy Sledge's "When A man loves a woman." The Stones' "Wild horses" and "Brown sugar". Tracks by Aretha Franklin, Etta James, Wilson Pickett, Lynyrd Skynyrd, Dylan, Bob Seeger, The Dead... If you ever heard a big bass soul sound, or a muddy Southern Rock track, both pulsing with that same blues, that's the Muscle Shoals sound. This new documentary tries to explain the mysterious, hinting at the topography of the Alabama riverlands, the spirit of the place, the deep authentic blues that comes of rural poverty. It speaks of the tragedy and injured pride that spurred the recording studios creator, RickHall, to succeed. It points to the radical and subversive fact that the famous rhythm section that played on those soul classics was made up of chubby white farmboys. And it shows how they then left Rick and formed their own studio across town. But the best explanation of all is no explanation a it's just the bald statement of fact from Keith Richards: that room just had the sound that you'd been travelling around the world trying to get and never succeeding, until you came to Muscle Shoals. As we listened to the great tracks, watched archive footage of them being cut, and reminisced with the artists, it was hard not to start believing in some kind of mystical magic to the place. To be sure, it would've been good if the documentarians could've pushed Hall and Atlantic Records boss Jerry Wexler more on why the infamous break occurred. It would've been great if we could've heard more from Jagger and Richards, always super articulate on the history of the blues. And the documentary does seem to just grind to a halt after couple of hours, there being no break up of the band, the usual ending for a rock doc. I also could've done without the musical epilogue of Alicia Keys singing in the room. Her polished look and smooth vocals contrast against the raw power and slightly shambolic look of the singers we've just been hearing, and she doesn't do well in the comparison. But all I can say is that was a pleasure and an education to spend two hours in Muscle Shoals - a pleasure that even the trite commentary of Bono can't diminish. MUSCLE SHOALS has a running time of 102 minutes. It played Sundance and Sundance London 2013 but it does not yet have a commercial release date.